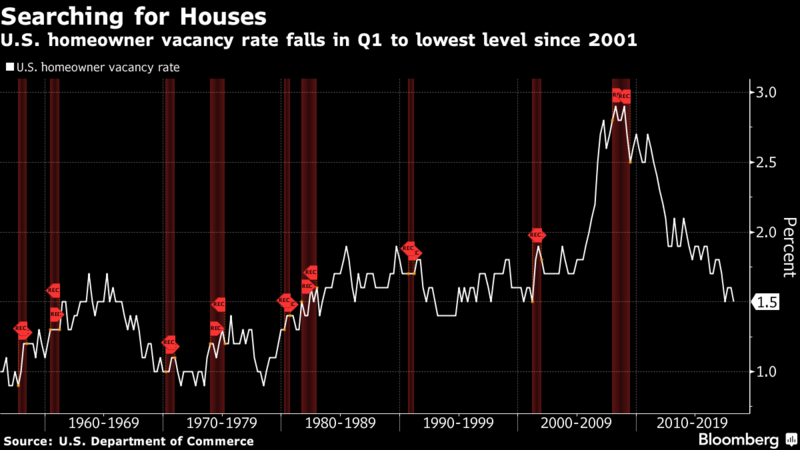 The U.S. homeowner vacancy rate dropped to 1.5 percent in the first quarter, the lowest level since 2001, a sign that houses aren’t going to waste amid a residential supply crunch. The rate was down from 1.7 percent a year earlier and 1.6 percent in the fourth quarter, the U.S. Census Bureau said in a report Thursday. The vacancy rate is the proportion of the non-vacation-home inventory that is vacant and for sale. The declining vacancy rate only adds to concerns about record low housing supplies, Genworth Mortgage Insurance Chief Economist Tian Liu said. There were 1.67 million U.S. homes for sale in March, down 7.2 percent from a year earlier and the lowest for that month in data going back to 1999, according to the National Association of Realtors.